The real estate gods and the chronic disease gods must be having a grand old time in whatever bar they’ve been drinking at these past few years. Aw, the sign lost a letter. Must not have been taking care of itself. That, as you can see, is the Diabe[t]ic Food-Wound Center, located two blocks from my home. Some might say I should consider myself lucky. If I find myself with a festering abscess on my heel, or if I sustain injuries from a over-zealous razor-wielding pedicurist, or if my crappy little dog gnaws off my toe in the middle of the night, I can just hobble around the corner! Up until a few weeks ago, the side-yard of the building was populated by a group of rusty, folding chairs that surrounded one of those smokers’ outposts. I always imagined all the Diabetic Foot-Wound Center employees sitting in the afternoon heat, complaining about their “noncompliant” patients, eating pork rinds and puffing on Marlboro Reds. 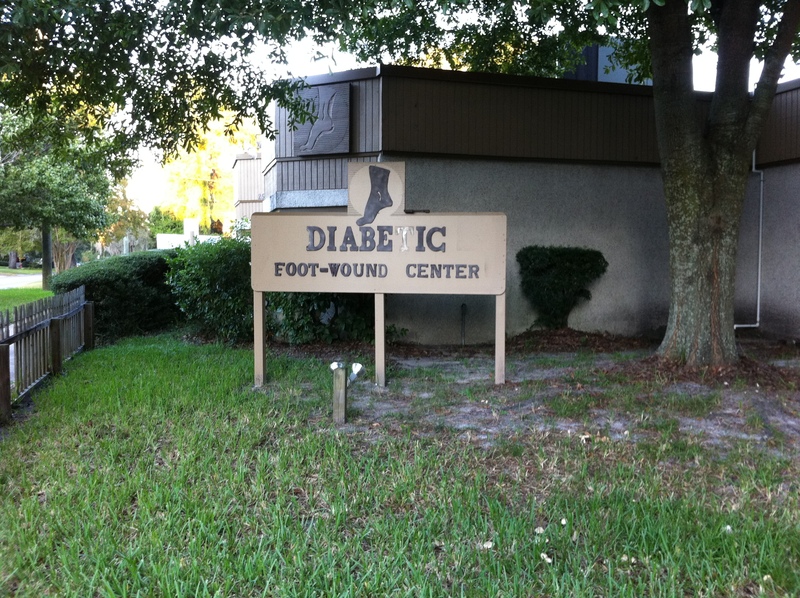 Even the name of the clinic make me itch: Diabetic Foot-Wound Center. Does that mean the center is diabetic? The foot-wound? Why is foot-wound hyphenated? And whose idea was it to add that disembodied foot to the sign? Isn’t that in poor taste? The good news is, I’m moving in a couple of weeks, so I won’t see the Diabetic Foot-Wound Center quite as often. Plus, I’m getting a back yard and a front porch and a fireplace and an extra bathroom. I’m getting the hell away from the ol’ DF-WC, and I’m taking my perfectly healthy feet with me. That foot looks like it has frostbite. Yuck! We have a “Diabetic shoe” place near us. I’ll have to send you a photo. You can start a collection! Oh man… I just about peed myself when I read the caption to the picture. Classic! LOL on the “crappy little dog” comment. You are hilarious!!! Oooh, and CONGRATS on your new place!!! LOL! It’s wierd – either I live in a bubble world here in Montreal – but foot clinics for diabetics – is something I’ve never seen … BUT on a recent holiday along the eastern seaboard in the States – I saw these places that you talk of (except they looked much nicer then the one you have around your corner. Like you, I’m Ms. Happy Fee after 44 years of the D. BTW, your new place sounds simply marvellous – you are moving on up!!! How does a place like this even stay in business? It seems like a real niche market. If you go there with a foot wound (say you step on a nail), but it has nothing to do with diabetes, will they treat you? I hate anything labeled “diabetic” . . . . except, of course, people with diabetes!! Diabetic chocolate? Hmm, must have too much sugar in it, huh? Diabetic friendly recipes? Does this mean the recipes will be nice to me but mean to my fancy-working-pancreas husband?? Geesh. So glad you are getting away from the floating foot and missing “t”! !